The stock earbuds that come with your portable playback devices actually spoil you for other headphones in more ways than you think. One of those facilities that become conspicuous in their absence is the volume control. When your phone or MP3 player is lodged deep inside the pocket of skinny jeans, you would prefer to have volume control buttons on your headphone. Many of us move on to large over-ear headphones in pursuit of audiophile-style music. But how many of us can say goodbye to the volume wheel/buttons of stock earbuds? Not many. 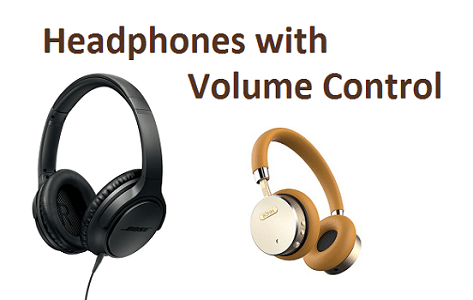 Which is why, we shortlisted 10 best headphones with volume control. We have covered a healthy dose of both Android- and iOS-compatible volume control headphones so that neither party feels left out. Why do the volume controls of some 3-button headphones work with iPhone but not Android and vice-versa? Many of us might not even have noticed this. The Play/Pause button of cable remote is universal and works with all Android and iOS devices. However, the volume controls of certain headphones work only with Android and not with iOS or vice versa.This is what they mean when people say that the 3-button inline control has ‘limited’ functionality with Android/iOS phones. different so it created its pinout with a different configuration: Left Audio, Right Audio, Ground and Mic. Due to this small change the volume buttons of normal headphones do not work with the Apple devices. There are plenty of volume control headphones that are configured for iOS. Some of the best headphones with volume control we covered here are available in two versions: Android-friendly or iOS-friendly. By selecting the right package for your phone, you can ensure that they work for you. Is there a work-around for this Android/iOS volume button compatibility problem? There are apps in Playstore than can alter button functionality. Headset Droid is one such application which can customize button functionality of the headphones connected to your phone. It runs in the background and uses minimal CPU capacity. You can set how a button responds to a click using this app. Headset Button Controller is another Android app that lets you customize button actions no matter which headphone you are using. The tough way is to split open the cable of your headphone and get working on it like a pro Electronic Engineer. The circuit changes are minimal but we still won’t suggest this method. Which are the best headphones with volume control? headphones usually feature bigger drivers for bigger and better bass and a more open soundstage audio performance. All the best headphones with volume control on this list have proven their mettle in the audio world. They bring you excellent acoustic value on money. Volume Control: You might be using your headphones for gaming, watching movies etc. It’s a pain to reach out to the system to change volume every time. So volume control is a must-have for the headphones selected here. We have researched and carefully selected headphones which have volume controls that are either compatible with Android with iOS. Features: Since convenience is on the top of your mind, you might be game for other features in headphones. 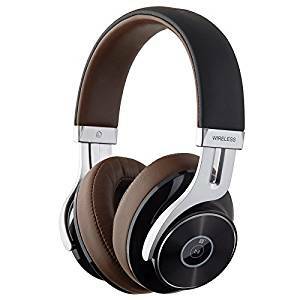 Some of the best headphones with volume control have Active Noise Cancellation(ANC), Bluetooth connectivity, foldability, ability to customize looks or hi-resolution audio. Value on money: We have covered the best headphones with volume control over a wide range of budgets. Since each person has a different spending potential, we judged these cans on the value they provide for money. It isn’t fair to compare two headphones of widely different prices. Hence our move to normalize the comparison. programmable button which brings up Google Assistant by default. How cool is that! The onboard controls are the reason why it lands on the best headphones with volume controls list. The crazy quiet ANC, the extremely comfy and lightweight design and the smooth audio are the extras that get you music–ready on the go. Bose QC35 II wireless ANC headphones make no secret of being travel headphones. The aesthetics are very generic and elegant. These fit in with the IT guy as well as the celebrity personal shopper. The build is mostly high quality plastic with metal trim on the back of the earcups. This results in only 8.25-ounce weight, and you rarely ever feel it on your head over hours of use. This doesn’t mean that these are rickety headphones. We have ridden them roughshod but they gracefully took all the abuse. The earcups are racetrack oval and padded lavishly. The headband only has a cushioned arch. Given the light weight and optimal clamp, this is enough. These are the most comfortable ANC headphones for music marathons and airplane travel. The highlight addition in these headphones over QC35 is the Google Assistant button they added on the right earcup. It instantly starts up the Assistant. However, it’s a programmable button that can be configured by the Bose smartphone app. The other most sought-after function programmed to it is the ANC level. The Active Noise Cancellation can be set on low, high and off. This button can toggle through the three states if programmed to do so. These headphones boast of 20-hour battery life with ANC and Bluetooth. They can be used in wired mode for up to 40 hours. They are available in black and silver colors. The volume control of these headphones flank the multifunctional button on the edge of the right earcup. These a are clearly marked so you can distinguish them by touch. These come with the charging and audio cable. A carry case is also included. The earcups of QC35 can be folded flat. The ear pieces also fold inwards for compact storage. The Bose ANC is still the top player in the market. The QC35 II headphones have the best noise cancelling chops. It completely eliminates the quieter low-frequency hums. The moderate frequencies are reduced to whispers. The high pitch sounds like conversation and ambulance siren are let through, though the edge is dulled. The ANC does not cause annoying hiss in the audio. The Bluetooth connection holds strong within the specified range. There’s no AptX supports though. Bose follows the standard non-rebellious sound signature. It’s warm, punchy and forgiving. The QC35 II headphones treat all genres well but cannot compete with audiophile headphones in the same price range. But we won’t complain, since they invest in top-notch ANC. The bass is meaty and defined but never bleeds into the mids. The Sennheiser Momentums have tighter bass, though the difference is perceptible to only trained ears. The midrange benefits from the wide open soundstage of QC35 II. It is decently detailed and smooth. The Sony WH1000MX2 sound slightly more alive in this department but it changes from song to song. The treble is crisp but polite. The QC35 II sound very relaxing which makes them perfect for the commute. The mic is quite focused and provides an excellent call experience on these headphones. everywhere. This is surprising since Bose has dominated at least the ANC niche for ages. 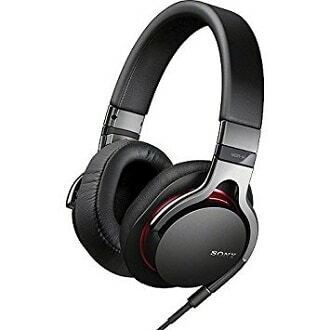 We are thrilled to see a Sony headphone ticking all the right prices and packing it in a reasonable budget. The touch volume controls are more responsive in this version, hence this place in the best headphones with volume controls list. The Sony WH1000MX2 ANC wireless headphones add a bit of flair in their design compared to the Plain Jane QC35 II. The design is still simple and goes well with both professional and casual looks. These are again plastic cans with metal trim on the headband. The build is uninterrupted by many buttons, since the volume and playback controls are through the touch-sensitive area on the right earcup. The earcups fold flat and swing inwards for compact storage. They are also comfy to wear around the neck. The ear pieces are racetrack oval and mounted with soft cushions. The draping material is much more wear-resistant than the previous version. These headphones are only nominally heavier than the QC35 II. The volume on these headphones is controlled by swiping on the right earcup. It also has the playback and call control. These are wireless ANC headphones, and the level of ANC can be changed. It can be set to high, low or powered off. Another brilliant feature is the Quiet Attention Mode. You can cup your hand over the right earcup to mute the music and ANC and hear ambient sounds. Very useful if you want to talk to someone without taking off the headphones. An optimizer feature uses pressure sensors and scans the side of your head adjusts the music based on the seal. This very useful when you suddenly change movement patterns or environments. These Sony headphones are supported by a smartphone app. It has a number of options to tune ANC and allow the kind of ambient sounds you want to hear. The battery lasts through 30 hours on wireless and ANC and 40 hours on wired mode. It also has the quick recharge feature where a 10-min charge would yield 70mins of power. 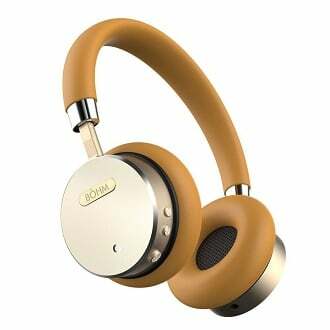 These headphones are available in a conservative black and a much more hep dull gold color. The Sony WH1000MX2 headphones blew us away with their adaptive ANC. For the first time, we conceded we couldn’t make up our minds between this and the Bose ANC. While the latter is powerful and easy, the Sony ANC is powerful and intuitive. The Bluetooth connection never ran into any issues. You can change settings in the app to ensure that priority is given to Bluetooth connection over sound quality in a crowded place. These headphones also support AptX HD. The WH1000MX2 also trumped competition in terms of sound quality. These are very lively, clean and detailed headphones to listen to. It’s rare to have audiophile sound qualities merged with ANC but these headphones do it. We found the bass to be punchy and tight. It could keep up with the complicated songs. The midrange is highly resolved and slightly more energetic than the QC35 IIs. The treble matches up to keep the balance tastefully neutral. We pushed them to the limit with some complicated mixes. The agility of bass and the articulate mids flowed effortlessly through the songs. No particular part of the frequency spectrum got more attention than the others. Sennheiser has touted their Momentum headphones in many forms: noise-cancelling, wireless, over-ear, on-ear etc. We picked out the Momentum 2.0 over-ear headphones as our best bet. They overcame the comfort issues of the first generation and turned the tide into their favor. The audio is a revelation with Sennheiser focusing on casual listeners rather than purists. Momentum 2.0 has a convenient buying option on their detachable cable as well. It just had to sit and sing pretty to top the best headphones with volume control list. 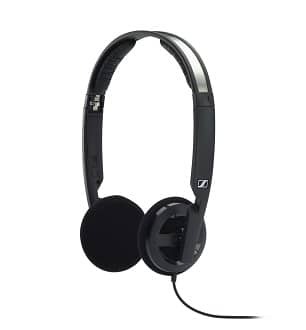 Sennheiser Momentum 2.0 volume control headphones are easy to pick out because of their novel design.The earcups look mounted on a padded metal arch. The original Momentums had smaller earcups than these. So they would rest on your ears and create pressure points over prolonged wearing. 2.0 version has big racetrack oval memory foam pads that engulf the ears. These are coated in real leather. They position correctly around the ears and put no pressure on them. The headband is similarly coated in foam and high-quality leather. The Momentum 2.0 headphones are available in either Android or Apple version. Only the detachable cables differ in both. If you buy the Android one, the volume controls of the 3-button inline remote will work with Android. Given the price that these cans demand, they could have included both cables in every pack. The cable attaches to one earcup with a twist-and-lock mechanism for extra safety. Since it’s detachable, you can always swap it out for a separately bought iOS compatible cable. The arms of the headphone fold into a compact structure. They are lightweight with optimum clamping pressure. The headband has only enough tension to hold them steady and this pressure is evenly dispersed by the soft earpads. The headphones are available in a whole black design with contrast stitching patterns. Otherwise you can go for the brown and tan model. Sennheiser has reserved the Momentum 2.0 volume control headphones for the music-loving non-purist group. They have the wonderfully enjoyable audio that takes small freedoms on accuracy to appease the ears. The bass is visceral and gauges much depth. So the sub-bass region has definition even at low volumes. The lower-registers sound meaty because of the tiny mid-bass bump which does not interfere with the mids in anyway. Midrange of these headphones with volume control has plenty of details. The refinement limits only to keep the music smooth and easy on ears. The treble sparkles the right amount to match up with the energy of bass. The rich and dynamic audio is set up in a massive soundstage with expansive stereo-imaging. Could have come with Android AND iOS cable for the price. 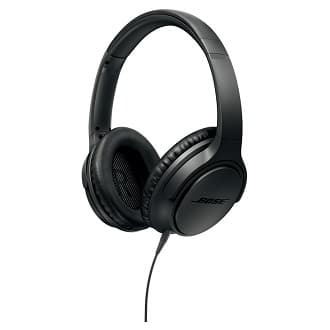 Bose QuietComfort 25 headphones come from their prestigious line of noise-cancelling headphones. Only second in line to the top(and more expensive) choice, QC35, these headphones have the volume control deal all figured out. Just like the Momentum 2.0, they sort their Android-friendly cable from iOS –friendly cable. 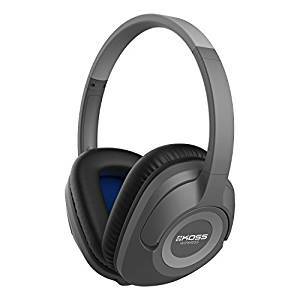 Although they demand a steep price, they have a lot to offer including best-in-industry Active Noise Cancellation (ANC). Packed with big audio, they easily made their way to the best headphones with volume control list. The QC25 headphone from Bose is one of the most comfortable headphones around. Weighing a meager 196g, it expertly balances lightweight characteristics with durability. The earcups are padded with foam sheathed in leather. The headband fits snugly with similar cushion underneath. The oval earpads completely encircle your ears instead of sitting annoyingly on them. The ear pieces fold flat and pivot on Zinc hinges for packing into a portable carry case. Clamp pressure is enough to hold the headphones stable when you run or jog, but not high enough to be painful in the long run. The ANC functionality of QC 25 volume control headphone works on AAA which last through 35 hours of music playback. This way you have the option to change batteries mid-flight if they run out of charge. It can also be used in wired mode without ANC in case you are out of batteries. You can turn this feature off. QuietComfort 25 headphones have a detachable cable with 3-button inline remote. You can either buy the Android bundle with the volume controls compatible to Android devices. Or you can choose the iOS bundle. The cable has a 2.5mm plug on the headphone end and terminates in a 3.5mm plug.They are shipped with an airline adapter and a carry case. 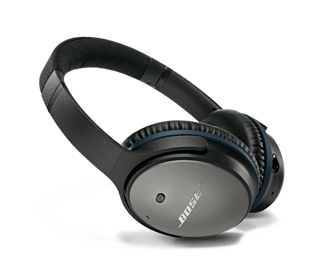 The ANC feature of Bose QuietComfort 25 volume control headphones is so effective that it is inherited without changes into their newer QC35. You get utter silence in the background which may take some getting used to. Since the major portion of investment goes into travel comfort and ANC, the audio of QC25 is conservatively good. The bass has a punchy presence. It rumbles well within its confines. The treble is bright and partners well with the lows. Midrange of these headphones is clean of any bleed-in from mids. The audio is set in a wider soundstage than any closed-back headphone should have. So the sound is open and airy.On an audiophile-level the audio response was quite satisfying. But if we compare it with the top headphones in its price range, it’s not the best. Given that no headphone can best QC25 in terms of ANC, we can take the trade-off. 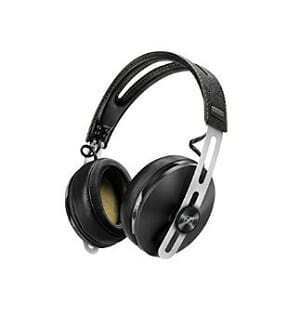 V-Moda is known for their sleek and stylish headphones. We could barely get over their Crossfade M-100 when we came across the LP2 headphones. One advantage they have over M-100 is that they are shipped with an iOS-compatible cable with a 3-button inline remote. The rest of V-Moda’s typical infantry of accessories and joyful audio is part of LP2’s package as well. For a basshead who doesn’t compromise much on clarity, these are one of the best headphones with volume control. V-Moda uses their trademark hexagonal earcups in the Crossfade LP2 volume controlled headphones.The backside of the earcups has metal plates. You get a gunmetal shield kit which can be customized with laser engravings. Both the earcups and the headband are generously padded and sheathed in leather. The earcups fit comfortably around small ears, but they sit on the large-sized ones. They swivel forward in the arch that connects to the headband. This way they adapt better to the shape of the user’s head. The steelflex headband expands to fit any dome size easily. To prove their strength, the LP2 headphones come with a Kevlar-reinforced 3-button Speakeasy mic cable and an extended audio cable for purely enjoying music. People who bought directly from V-Moda get the iOS-friendly volume control cable but on many platforms V-Moda has listed a 1-button mic with LP2. The cables end in a 3.5mm plug. They are accompanied by a 6.3mm adapter that can be plugged into studio equipment. Apart from all these great accessories, LP2 also comes with an Exoskeleton hard carry case with a V-Strap to hold the headphone securely. A carabiner clip is shipped to connect this case to any loop. 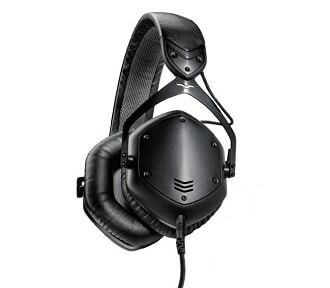 V-Moda LP headphone line usually emphasizes the bass performance. LP2 is no different. There’s a guttural storm in the lower registers of its audio response. If you are a basshead, this would sound spot-on. If you are a die-hard purist then you might term the bass to be ‘loose’. Bass is also laidback as in it does not respond to rhythm changes with agility. This helps its case in case of genres like EDM, Techno , Hip Hop etc. The midrange of these volume-controlled headphones is smooth. In bassy songs, you can spot the bleeding of bass into the midrange. The high end is clear throughout with sparkly treble to go with it. The mids are the only unflattering portion of their frequency response. Bluetooth headphones take away the confusion of in-line control because their volume controls work with all devices. That’s why we picked a moderately-priced high-functioning Bluetooth headphone for our list next. The BÖHM Bluetooth noise-cancelling headphones are everyday Joe’s Bose QC 35. At less than one-third the price, you get ANC and an art piece of a headphone. This on-ear model is absurdly comfortable and has jewel-like buttons for volume control. We flew it right into the best headphones with volume control list. The BÖHM Bluetooth ANC volume control headphones tread a fine balance between functionality and budget. They have plenty of features and they are executed properly under the price. They are gorgeous with their metal and leather construction. The earcups are supra-aural. They sit on the ears and allow more ventilation compared to over-ear headphones. The matte metal backplate of the earcups have glossy beveled edges. The buttons for volume control and ANC sit like jewels on the earcups. The headband and ear pieces have foam padding sheathed in protein leather that makes skin-like contact with your skin. The Active Noise Cancellation feature is fairly good on BÖHM wireless headphones. It diminishes the low-frequencies drones like AC, engine etc. The high frequency noises are muffled to some extent. The effect is not as complete as the QuietComfort 25 headphones. But they cost almost thrice as much and are over-ear headphones. The ANC functionality can be switched off on BÖHM headphones. Bluetooth has a range of 33m on this headphone. So BÖHM can be used as a headset. It can go through 16 hours of music playback or 18 hours of talk time on one charge. The volume buttons sit at the bottom of the right earcup along with the multifunctional button. It can be used in wired mode with the supplied cable. This cable has inline remote with mic. BÖHM Bluetooth headphones have plenty of hi-end gimmicks so you would expect it’s audio to be down the drain. Well, clearly not. BÖHM has an enjoyable sound which can impress any casual listener. The bass is meaty with a small mid-bass bump. It doesn’t have the extension of Momentum or QC 25 but there’s plenty of punch. The midrange of this volume control headphone is clear and devoid of any bass bloating. There are plentiful details here to transform your movie experience. The vocals are clear at every volume and stand out from the background din. The high have good detailing and remain crisp across all genres. The audio quality of calls also matches with these standards. They sound clear and articulate. they have large and tactile volume controls on the right earcup. Koss uses some of their well-tested comfort and audio features here for excellent sound and long-term comfort. These took a short flight to the best headphones with volume controls list. The Koss BT539iK wireless headphones are lightweight and built for comfort. These weigh only 6 ounces and are great for the commute. The earcups use the iconic D-shaped design that brings a much better seal than any other shape. It easily accommodates large ears. The ear cushions are plush and deep. Your ears can sit completely inside than have the pad press over them. The headband is slim and not padded much. But the low clamp and lightweight ensure this is not an issue. It has multiple detent positions while for extension. The build is all plastic but sturdy for regular use. We don’t recommend rough use through. The earcups have nominal rotation inwards to adapt to your head shape. These headphones carry volume and track navigation controls on the right earcup. There’s a large control pad with these buttons. The center of the pad has the multifunctional button which controls power, calls and music playback. On the other earcup, you have the indicator LEDs, the 3.5mm port and the mini USB charging port. These Bluetooth v4.0 provides wireless connectivity. It offers a battery life of 12 hours per charge and 40 hours on standby. When it runs out of charge, it can be connected via the audio cable. You can listen to them while you charge them. The earcups of these Koss headphones fold flat for storage but a carry case is not provided. The cable and charging cable are color-matched to the fabric inside the earcups. The Koss BT539iK wireless headphones do not fall into the trap of usual bass-boosted headphones at this price. The audio signature is much like the wired UR42i headphones. These are balanced and natural sounding. The bass has plenty of punch and hits all the right notes. It can be a tad more detailed in the Bluetooth mode, it certainly has slightly better definition in the wired mode. Nevertheless, bass does not intrude the midrange and stays tight. The midrange plays in a good soundstage with decent details. If you are traveler on a budget, these are good for classical and orchestral music. The sparkle of treble makes the sound more exciting and bright. The sound can be very immersive with the right source material. They sound smooth and easy on all types of recordings but good source material sounds better. For Bluetooth headphones, these sound very natural. The Bluetooth connection holds strong within the 30 feet range. are one such value-for-money pair. These have an energetic sound signature pair with commute-friendly, comfortable design. These are stylish, affordable and a perfect candidate for the best headphones with volume controls list. The Edifier W855BT headphones look pretty dashing in their plastic and metal build. The headband seems to be reinforced with metal and the ear piece forks are done in brushed aluminum. The color scheme is black and brown which has been elegantly mixed. The ear pieces have a glossy black finish at the back. They are mounted with soft and deep cushions. They are draped on quality faux leather. The headband has a black leather trim above and brown underneath. The earcups swivel forward a bit to adjust to your head shape. The right earcup of these headphones have the playback controls. There a button at the center for multiple functions like playback and call control. These are flanked by somewhat shallow volume buttons on left and right. For some weird reason, the track buttons are not programmed above and below the multifunctional button although there was space. The build is sturdy but we wouldn’t abuse them too much. These Bluetooth headphones connect via Bluetooth V4.1. They can also connect through NFC. You get 20 hours of playback with a single charge. These can be used in wired mode when the battery runs out. The W855BT comes with a clamshell carry case, an audio cable and charging cable. These Edifier headphones support AptX which provides better Bluetooth definition with a compatible device. They go for a fun and balanced audio. They aren’t as clinically neutral as the audiophile purist headphones. The bass is punchy and meaty. It may have a small bump that makes it sound a tad forward. But it doesn’t bleed into the mids. The treble is likewise bright and revealing. It lends a sense of transparency to the audio. It matches up with the treble in its energy. The midrange is flat and decently detailed. But with attention on bass and treble, it sounds slightly recessed. The sound signature is not a bold V though. This makes the W855Bt sound accurate without giving up the fun. The dynamic sound flatters all genres well. They respond well to lossy and flawed recordings too. good to be true but the overwhelmingly positive user feedback got our attention. These are truly comfy headphones with large on-board volume controls. What more can we ask of one of the best headphones for volume controls? The Alpatronix HX101 wireless headphones remind us of the Bose headphones. These are very simple but elegant in their form factor. They are done up in matte charcoal black. The earcups are racetrack oval and sit around the ears easily. They are mounted with cushy pads sheathed in faux leather. The pads are deep so they rest barely along the edges of the ears. The headband is moderately wide and padded as well. The arms of the headband articulate and reduce it to half the footprint for compact storage. The earcups swing forward a bit for proper fitment. They fit low profile. These headphones have a control pad on the right earcup. This has large volume controls, track navigation buttons and a multifunctional button. For wireless connectivity, they feature Bluetooth v4.1. They also have a very capable mic armed with a noise-cancelling technology that removes ambient noise from the speech. The battery lasts for 30 hours per charge and claims over 900 hours of standby. These can be connected to the playback device through an audio cable when the battery drains. They come with compact case, the audio cable and the charging cable. 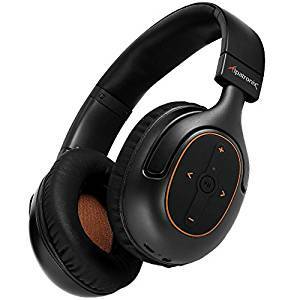 The Alpatronix HX101 wireless headphones showed competitive edge with its Bluetooth connection. They stayed connected strong and fast within the 30 feet range. Things only got choppy when more than 3 devices were connected via Bluetooth to our playback system. The AptX support is also big plus since this enhances the wireless audio quality over Bluetooth. These headphones offered up plenty of bass. The bassheads will get a kick out of the meaty lower registers. It’s not just quantity, bass offers quality definition too. Needless to say, there’s some spill over to the mids but it’s barely noticeable to a casual listener. The vocals are very clear and the strings get enough space to present themselves. The treble is energetic but without any bite. We don’t hear any harshness of boominess with these headphones at any volume. 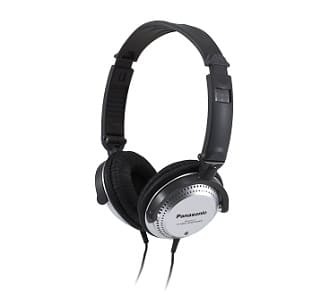 If you are on a tight budget and still want to invest in a trusted brand, Panasonic RP-HT227 headphones might do the job. These inexpensive headphones use a volume wheel to manage the volume of playback devices. Since these are primed for travel, the volume wheel is a big help. It saves you from reaching out to the volume controls of your entertainment system during flight. They pack an amazing sense of durability and audio for their price. That earns them a spot on the best headphones with volume control list. Panasonic RP-HT227 headphones are a pair of on-ear cans like BÖHM, that is, they rest on the ear rather than around it. This design may take some getting used to. The upside is they don’t look dorky on your head. The build is mainly plastic but the backplate of earcups are metal with a stylish pattern and branding. The earpads are cushy and coated in pleather that rests softy on the ears. The headband is only lightly padded but it’s comfortable for continuous use.It can be extended on either side to fit your dome. The cable of these volume control headphones is connected to both earcups. When most cans are moving to one-sided cable, we found this to be a small inconvenience. After the Y-junction, you find an inline volume controller that works with most devices. It is built to tactile advantage and is easy to spot in the dark. The cable ends in a 3.5 mm jack. A threaded 6.3mm adapter is also provided to connect the headphones to home or studio equipment. Owing to the travel-friendly image of the RP-HT227 headphones, their arms can fold to reduce the footprint of the headphone by almost half. The earcups rotate to allow single-sided monitoring when you have to pay attention to flight instructions. For headphones the price of RP-HT227, it is not fair to critique based on bass, mids and highs. These are not made for audiophile grade music. But they perform their basic duties very well. There’s plenty of bass so you won’t complain the music of being tinny compared to stock headphones. The audio is clean and you can easily hear the dialogues of the movie on a plane. There’s a moderate amount of noise isolation also. Issues like distortion or sibilance were not reported with the performance of these volume control headphones. While they don’t offer the details or brightness of expensive headphones, they have enough details to sound clear. 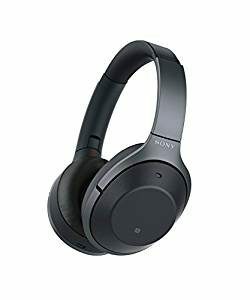 Sony MDR1R headphones are one of their moderately-priced headphones. They have come down on the price ladder lately. Their USP is that they come with two cables: one with inline volume and mic and another, a plain cable. They have Sony’s excellent architecture that is designed for long-lasting comfort. The audio is modeled to sound fun just like the Sennheiser Momentums. At their current price, they are a worth-it deal, hence their place in the best headphones with volume control list. Sony mixed Aluminum and plastic at optimum proportions to create the MDR1R volume control headphones. These feel solid in your hands but they are lightweight at 8.5 ounces. Most of the metal goes at the back of the speakerplate. Sony has indulged in fashion here. They go for a cool modern look for the MDR1R. Both the headband and the earcups are padded and draped in synthetic leather. The padding goes from ear to ear on the headband. The earcups are racetrack oval and engulf the ears. Earpieces swivel flat on metal hinges. The detachable cable of these headphones can connect to either side. The plug goes into a tube that’s connected to the swiveling bracket of the earpieces. They come with two cables. One is a plain audio cable. The other one has an inline mic and 3-button remote. Of these, the volume controls only work with Apple devices. Replacement cables with Android-friendly controls are easily available for MDR1R. The cable is tangle-free. Like most of their other offerings, Sony MDR-1R headphones ace the comfort part. The sizeable earcups provide good passive noise isolation. But unlike the dork-like headphones of Sony, MDR-1R does not stick out a mile from your head. It is relatively sleek-looking. Sony MDR1R is an all-genre headphone. The audio is refined enough to sound smooth with all types of music and recording formats. The bass has a rich definition and extends deep into the sub bass region. So even though there are bass-heavy headphones like V-Moda LP2, you can differentiate certain bass pitches only with the MDR1R. The detailing of low-end is superbly done. The midrange benefits from the wide and deep soundstage. It is not as detailed as the Momentum 2.0 but the tonal balance makes the audio sound very natural in MDR1R. The airy audio and detailing combine to form a realistic movie-watching experience with these volume control headphones. You will be listening to sonic intricacies around your head rather than inside it. The bass makes Hip, EDM and Techno sound like a blast. But you will be amazed at the subtlety of female vocals and treble detail as well. Sol Republic has a solid performer in the Tracks HD headphones. These are cans that play into the aesthetic and acoustic tastes of today’s generation. Because of their modular design the look of these headphones can be altered. They even have detachable cables with volume control. All the funky colors offer comfort along with stylish looks. Sol concentrates on bass in Tracks HD. For their low price, they bring a lot to the table. There’s no way we could have left them out of the best headphones with volume control list. Sol Republic Tracks HD volume control headphones look like they just fell off the geek ramp. They look fancy in a tech-savvy way. The two earpieces known as ‘Sound Engine speakers’ are mounted on a headband. The headband is quite flexible. It can be bent flat out of shape and it still springs back into the original form. The earpieces are done with black earpads and muted silver speakerplates. You can buy spare headbands of other colors and change them to go with your attire or mood. There’s cranial padding on the headband which makes soft contact with your head. These headphones use a detachable cord which connects to both earcups. There’s an inline 3-button remote on the cable. Its central button works with all devices but the volume controls are only for iOS devices. The cables are color matched with the headband color. If you own an Android device, you can order an Android compatible cable for it like New Neomusicia replacement cable for Sol. These headphones can replace Beats Solo2 for both appearance and audio quality. For more Beats-like headphones that are better than Beats, click here. 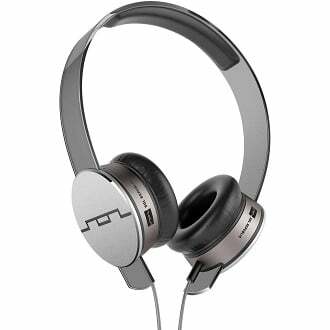 Sol Republic Track HD headphones were a revelation given our presumptions. Since these look like Beats contenders, we expected a similar audio signature as that of the Beats Solo. However, Tracks HD show much more refinement in their audio. The bass has a definite boost but not enough to put the balance off kilter. The midrange is clean and does not invite any muddiness from bass. The treble is bright and matches the bass in its energy. The soundstage of these volume control headphones is wide for their closed-back design. The warm audio plays loud and with good extension on either side of the spectrum. So you hear details even when the volume is turned low. Bose is so famous for their QuietComfort line that it’s easy to forget their other great headphones like Around-Ear II. There is no questioning the comfort of these headphones either. They match their legendary cousins in terms of keeping your ears happy. Like QC25, these also come with an option of either iOS-friendly remote on the cable or Android-friendly. We enjoyed the ability to choose that, so much so put the SoundTrue II in our best headphones with volume control list. Since the SoundTrue II volume control headphones do not carry any wireless or ANC circuitry they are lighter than the QC25s. At 181g they weigh only half as much as the Denon D600s.But they have upgraded from the original SoundTrue in terms of durability. The headband is much wider and dissipates the weight of headphones more effectively. They feature fully oval earcups likeQC25. These are lavishly padded and yet go around the ear as specified by the name. The cable of this headphone is detachable. It connects only to a single side and is therefore easy to replace. You select a bundle that comes with Android-friendly remote or the other that comes with iOS-compatible remote. This is the same choice that you get with QC25. If you pick one, you can easily buy a spare cable for the other platform. The earcups of the SoundTrue II headphones fold flat. So it easily fits into the flat rigid case provided by Bose. The ear pieces provide a good seal over your ears, so you get some passive noise cancellation as well. We found the SoundTrue II headphones to be generally agreeable to all our music. There’s oomph in the well-defined bass frequencies. But it is tightly controlled and balances the audio response. The soundstage is big and open despite these headphones being closed-back. The tonal balance makes the audio sound very natural, just not as energetic as the expensive headphones like Momentum 2.0. The midrange of these volume control headphones is the real stunner. You get a ton of details and clarity. The vocals shine with subtle changes in the voice making themselves known. Highs are smooth and detailed. There’s no edginess that used to creep into the highs in the original SoundTrue. Bose plays the safe route with audio here. Denon headphones ride the high tide in the audiophile market.Their AH-D600 is one such headphone that brings premium audio to the table. It comes with quite the haul of accessories. These include a cable with a 3-button iOS-friendly remote. Denon has added some metrosexual funkiness to the design of the headphones, which did not convince us entirely. But beauty lies in the eye of the beholder. With a heavier low-end, this headphone treats the bassy genres very well. It rode the wave right into the best headphones with volume control list. The design of Denon AH-D600 headphones is nothing like that of the dignified audiophile headphones. They use a combination of white and black which looks equally attractive to kids and young adults. The headband is all black right till the back of the earcups which carries the Denon logo. It’s made of anodized metal hence its sturdy feel. The cranial arch has foam padding stitched on to it with white thread. The ear pieces are white with black memory foam padding. D600 uses pentagonal earpads that sit comfortable on the ears with quality synthetic leather coating. The closed design and encircling earcups help with noise isolation. These volume control headphones come with two types of detachable cables. One is what Denon calls ‘obsessively’ long 10 foot heavy-duty cable for home applications like watching TV or movies on PC. The other one is a 3-foot long portable cable with a 3-button inline remote. The volume buttons here only work with iOS devices. Unfortunately the cable connects to both earcups and it’s harder to find an Android replacement. 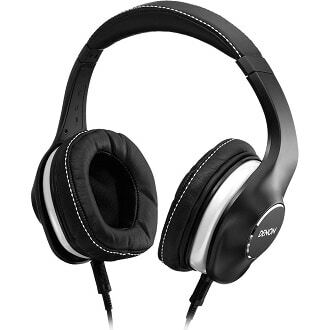 Denon packs a lot of punch in the lower registers of the AH-D600 volume control headphones. In fact they almost hint at being too bassy. As result, the audio is not as balanced as the Sony MDR1R. But the bass is not as loosely held as Beats headphones. So it does not muddy the mids for most part. Bass has good extension into the lower end. It is set in a majestic soundstage, so the audio has impressive energy. The midrange is fairly clean except in the subtle songs. The treble extends well into the high frequencies. The audio is best suited for genres like Hip Hop, Rock, EDM etc. Sennheiser has a healthy presence in the budget headphones market also. Those of us who look for over-ear headphone comfort with affordable, lightweight build should consider their PX100-IIi headset. It is special also because it comes with a 3-button remote that is completely compatible with iOS devices. The foldable package of these headphones is compact and portable for everyday use. We whipped them up right into the best headphones with volume control list. The PX100-IIi headphones from Sennheiser are as petite as one of those PC headsets. The lightweight headband can easily manage the weight of relatively small on-ear earpads. The sides of cranial arch under the headband are padded and swathed in faux-leather. The earpads are little foam circles that sit on the ear given the clamp from the headband. The size of the headband can be stretched to meet the demands of your noggin. The 4-foot cable of these volume control headphones is permanently attached to the right earcup. One-sided cables like these are easier to manage and pack away. There’s an inline 3-button remote on this. The volume buttons work only with iOS devices like iPhone, iPad, iPod etc. The PX100-IIi headphone can be folded to the size of a pair of sunglasses. It comes with pouch which can easily fit into your pocket too. The PX100-IIi volume control headphones do not differ much from their predecessors in terms of sound signature. They do sound much better though. There’s a marked emphasis on the lower frequencies. The popular concept of casual listeners of needing a big dose of bass is all there. It does not give away to muddy audio though. The midranges and highs are clear. They have a nice sprinkling of details which makes these headphones big bang for the bucks. If you want to enjoy good sound every day under a budget, PX100-IIi can easily shoulder the responsibility. Headphones Compared © 2019. All Rights Reserved.